WineStatistics will be evaluating wines in no particular order on no particular schedule. Just stay tuned and you will never miss one. If the wine is tasted more than once, the rating table will be updated so as to reflect all the new impressions and observations. The logic is simple – the more we taste, the more we learn. Tonight we are going to review a wine that originates from one of the most appreciated winemaking regions in Italy – Veneto, which is famous for many tasty things, but the one that stands apart is the fizzy-fancy wine made of glera grapes – Prosecco. 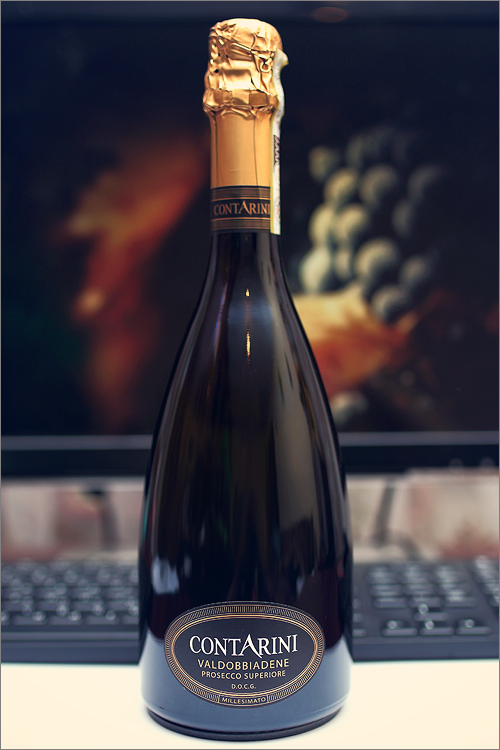 The wine that we’ve selected for tonight’s review is Valdobbiadene Prosecco Superiore 2013 from Contarini. This is the most famous italian crémant wine, made in a non-traditional, tank method style, also called méthode charmat – a wine style that is growing in popularity with each passing season. The wine has a pure topaz-green color, slightly into the yellow side of the spectrum, with a very clear white-green rim color. The nose is rich and clean, with no signs of wine faults. The first nose is elegant and insistent, it mixes savory notes with sweet fruits aromas: green pear, fresh cut straw grass, green apple, green bell pepper, white nectarine, nettle, white grapefruit and celery. Later one, as the temperature rises, the wine will open up with notes of white peach and chalkstone. The wine is medium dry with light alcohol level. High acidity, a very important element of every crémant wine, is well integrated into the body and in tandem with the soft tannin, it forms a fair and delightful overall balance. The wine tastes fresh, savory and crisp at the same time. This is a lean, friendly and well structured sparkling wine. The wine has a medium and rich aftertaste, with a balanced-sweet finish – it feels a bit bitter, but elegant and smooth at the same time. This is definitely a great Wine of Moldova and the overall rating says the same, with 90.5 points scored it is right there, among the best wines we’ve tasted so far. Please click on the chart icon on the left in order to get to the wine rating page, where you can find all the wines we’ve tasted to date. Last but not least, it is to be mentioned that there is a great rivalry in the world of wine between the classic method and the charmat method. While the old school followers opt for the classic method, where bubbles are created inside each bottle, thus making the wines more expensive and more sought for, the new school followers, on the other hand, opt for the charmat method, where bubbles are created in temperature and pressure controlled tanks, thus making the wines more accessible and fresh. Prosecco is the wine that broke all stereotypes – Italians mastered the charmat method as no one did before, thus raising it to a completely new level, right there among the best crémant wines – wines that are now considered a must try. (c) The WineStatistics ratings are based solely on our own knowledge of the world of wine and on our personal wine tastes, which may, or may not, differ from yours – the reader. There are no absolutes of right and wrong in wine appreciation.